Check out my newest post in Psychology Today entitled: “There are Angels in Manhattan“. It was also featured on the website: Day 1. There are angels in Manhattan. Did you know that? Oh sure, they’re also in Jersey and Georgia and Jordan and Johannesburg. But they are also in Manhattan … although no one believes it. I find this hilarious, since New York City is a place where you can see anything and everything: a naked cowboy playing his guitar in the middle of Times Square, a man walking down the street in an expensive three-piece suit and bunny ears, and even Spiderman playing the saxophone in the Union Square subway station. It’s understandable. Angels are a sneaky bunch. They like to work incognito—under the radar. They operate in unexpected places, through unassuming everyday people like you and me (kind of like in the movie Ghost, where Whoopi Goldberg channeled Patrick Swayze). 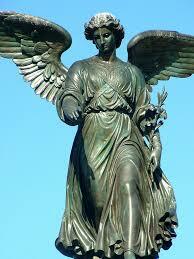 Any time there is an opportunity for a kind gesture, miniscule as it may seem, angels will swoop in and make it happen. Why? Because that’s how you change the world. And this is not some Hallmark sentiment. This is scientific fact. There is an often-quoted theory known as the butterfly effect, which holds that a single occurrence, no matter how small, can change the course of the universe forever. For example, the flutter of a butterfly’s wings in China can ultimately cause a hurricane in the Gulf of Mexico. Of course, if the flutter of a butterfly’s wings can change the course of the universe, how much more can the flutter of an angel’s wings? Tiny acts of kindness can reverberate through a person’s life, through those around them, and, ultimately, through the world. Think about the people in your life who have shown you a little kindness along the way. Then think about the effect it had. Oprah Winfrey, for example, tells a story about her fourth grade teacher, Mrs. Duncan. At the time, Oprah was scared to raise her hand in class, and it was Mrs. Duncan who helped her find the courage to answer, to be smart, to read, and to nurture her mind. We all know the rest of the story. A tiny act of kindness in an elementary school room in Nashville, Tennessee, truly changed the world. It doesn’t have to be Oprah. Recently, I was standing in line at a coffee vendor on 181st Street. An elderly woman in front of me ordered a coffee (price $1.50) and then slowly held up a quarter in payment. The vendor looked at her for a minute, and then, with an almost imperceptible smile, took the quarter and handed her the coffee. While the act itself may seem tiny, perhaps that coffee was the only “meal” she was to get that day. We may never know the consequences of our actions, and we may never see the angel that swooped in and channeled their power through us in that moment, but they were there and, in that moment, the angels made us part of something bigger and more powerful than anything we can imagine. So I return to my original premise: there are angels in Manhattan. Believe it—don’t believe it. It’s up to you. But they are there, waiting and watching for an opportunity to change the world. The question is—will you play a part?